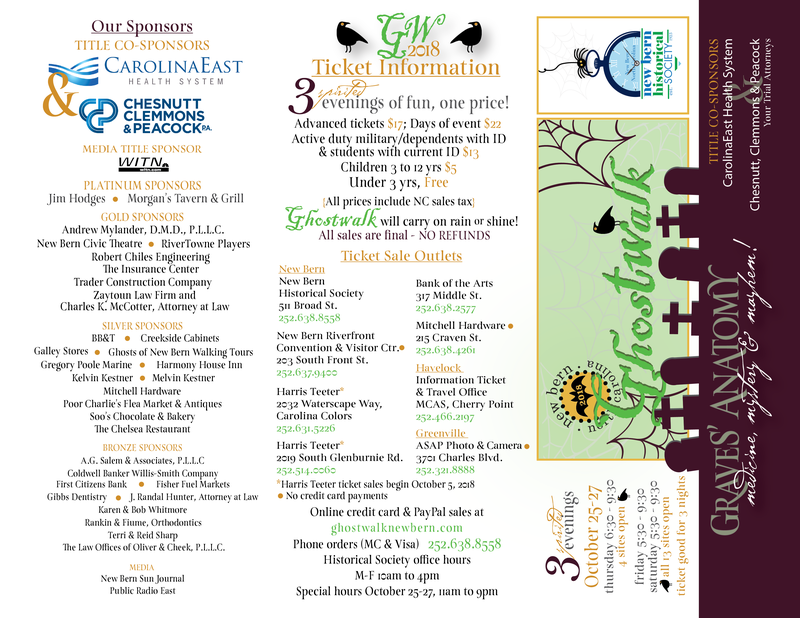 Support New Bern Historical Society’s largest annual fundraiser! Ghostwalk is a family-friendly event that combines historic spirits, talented local volunteer actors, historic sites not normally open to the public, and a fun-filled, creative environment. It is NOT a haunted house! 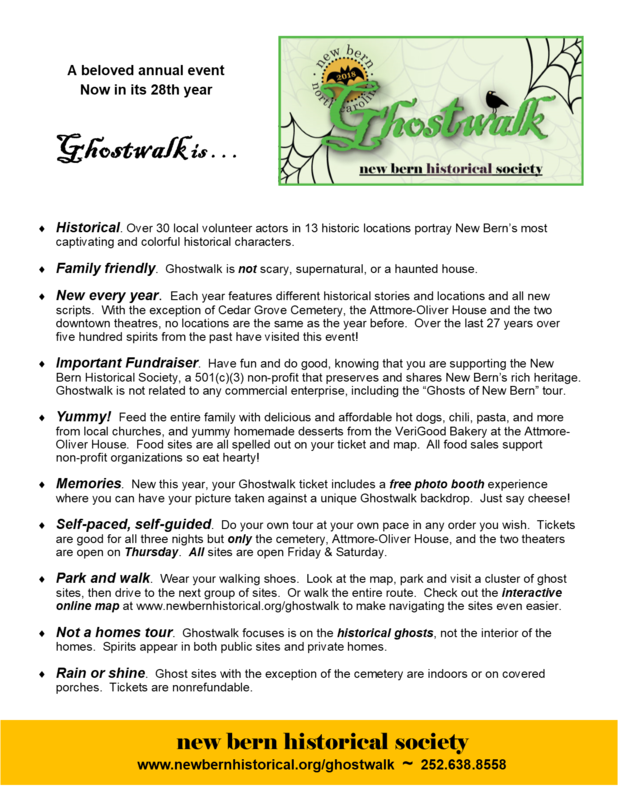 Ghostwalk is a self-guided event that allows you to step into New Bern's past. Meet spirits at 13 different historic ghost haunts including homes and theatres. Enjoy the ghostly actors who will share their spirited stories in the very locations that their characters lived and visited. Your ticket is good for all three nights and contains your map with ghost sites and food sites for you to enjoy in any order you like. 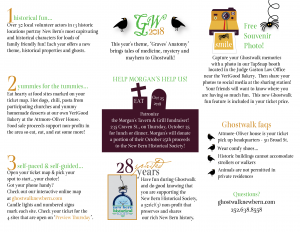 Click here for Ghostwalk 2018 online map. 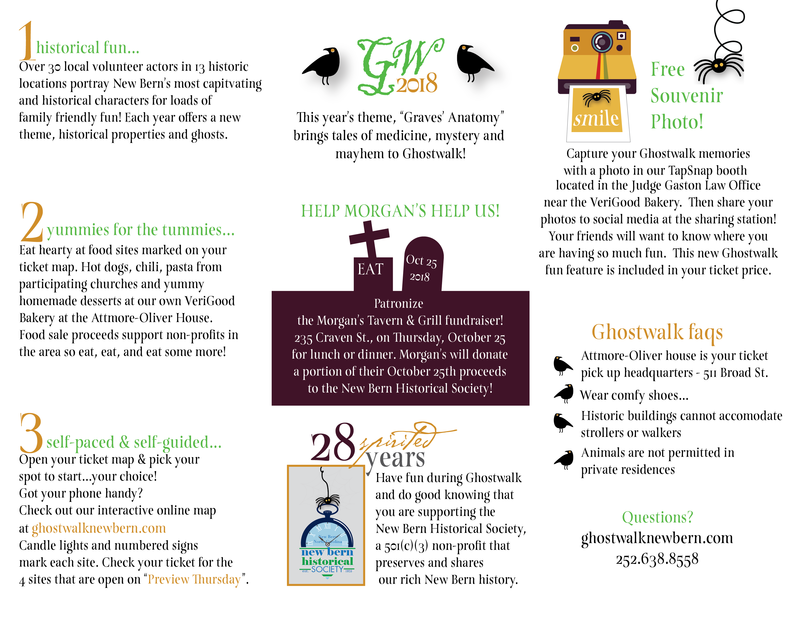 Thursday, October 25 from 11 am to 10 pm: Kick off Ghostwalk by eating at Morgan's Tavern & Grill. A generous portion of the proceeds from the entire day go to support the Historical Society. ♦ Skit "Hearts Desire" featuring the Dowd Family at the Attmore-Oliver House. + Four historic churches will be selling food and/or providing tours. Tickets are good for all three days but only limited sites are open on Thursday. See schedule above for details. 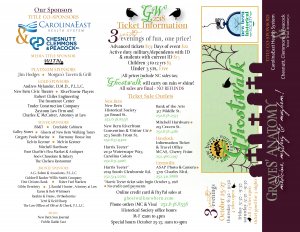 Tickets purchased online can be picked up at 'will-call' at the New Bern Historical Society office, located at 511 Broad Street. Regular office hours are 10am-4pm; during Ghostwalk 11am-9pm.